Stem cells of varying potencies originating from the organ generating totipotent embryonic stem cells (ESCs) to terminally differented cells such as platelets formation, via pluripotent hematopoietic stem cells (HSCs), and their downstream multipotent mesenchymal stem cells (MSCs), have in general been well characterized. Thus majority of these different stem cell types and their differentiation progeny can be tracked for subjecting to further characterizations for clinical relevance and consequently needed biological modifications at the cellular and molecular levels, for patients clinical treatments. The very first section of this books contents deal with the above stated description. 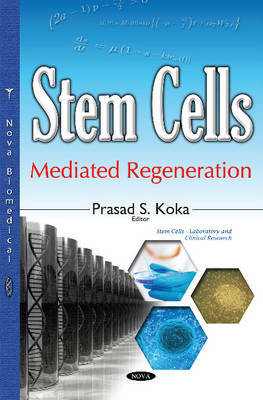 Such characterizations and research laboratory manipulations of the stem cells have led to their clinical grade applications and treatments with positive benefits, as described in the second section of this book. The clinical benefits as published by Nova Science Publishers herein as part of the contents are of tremendous significance and provide relief to the handicapped individuals, particularly for those who suffered lifes biological hazards. This naturally seeks R&D-mediated bench to bedside benefits and solutions for the genetically defective individuals. Bone marrow-derived stem cells with HSCs as their primary components are increasingly being cast the human eyes with pregnant females resorting cord blood banking as they peek to dwell into the future well being of their offspring(s) which could even benefit their own selves, should there be expectedly sufficient HLA matching. The third section of this book deals with such topics. The induced pluripotent stem cells (iPSCs) which were generated to overcome the ethical considerations of using ESCs were fraught with elaborate molecular and cellular biological engineering methods and the advent of derivation and usefulness of MSCs have since sidelined or relegated the iPSCs to a distant role. Nonetheless the hitherto served purpose of iPSCs is not discounted and yet unknown stumbling blocks of what seems to be a smooth going runway of MSCs may spring up in the clinical paths necessitated by the treatment along the future. In the fourth section of the book, it is to be kept in mind that uncontrolled proliferation of cells should be avoided at all costs. Whereas self-renewal of stem cells is generally expected to lead to a turnover, it need not be the case with regeneration processes. This will depend upon the genetic make up of the donor-derived and invasively injected stem cells plus accompanying biological reagent components, as well as also the recipients physical conditions. The fifth and last section of the book deals with conventional and alternative medicine topics applicable to carcinogenesis or such tendencies. Telomerase activity is a double edged sword. Therefore its homeostasis or equilibrium is to be maintained. Discriminatory apoptosis that is of beneficial nature affecting malignant cells but not the normal cells is necessary. Thus equation between apoptotic and telomerase activities even those of stem cells should be as hand in glove.